Bryan Hayden has a very interesting (and freely accessible!) paper at the Oxford Journal of Archaeology on reconstructing Neanderthals society, which was apparently much like ours for similar conditions (small operative bands of 12-30 people linked in larger ethnic and/or clannic groups through seasonal meetings and general social networks). M. Mozota has a quite interesting review at his blog as well for those who can read in Spanish. The site of As-Suwayda (or Sweida), dated to c. 14-9 thousand years ago, had 12 circular huts, two of which were more complex, suggesting to some the beginnings of social stratification (or could be communal buildings?) The two more complex (not larger) huts were located to the south of the village and show, one, inner divisions and an internal elevated platform, and, the other, external platforms and a trench. All huts are 4-5m. round. The Natufian culture is one of the beginnings of sedentarism, as their members lived largely on recollection of wild cereals, although it is generally understood that there was no productive agriculture yet. ··> Servicio de Información y Noticias Científicas[es]. The significant aridification recorded after ca. 4,000 years ago may have spurred the widespread adoption of sedentary agriculture in central and south India capable of providing surplus food in a less secure hydroclimate. A very interesting article in Spanish language by J.M. Arévalo discusses the use of animal traction in the Chalcolithic of Mucientes in the Northern Iberian Plateau during the 3rd millennium BCE (c. 2830-2290 BCE). Article available at Periodista Digital[es] and Asociación los Dólmenes[es]. The production, use and export of threshing teeth, made on flintstone at Cantalejo, emphasizes the almost necessary use of ox traction (horse domestication is unclear for the period while oxen remains are consistent with such kind of work). 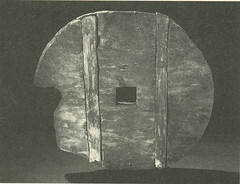 Interestingly the article is accompanied by an image of what may well be the oldest preserved wheel in Europe (Ljubljana, 4th millennium BCE, many centuries before Indoeuropean arrival, pictured). Nerja rock art will be directly dated: the calcite layer over them will be dated so the doubts on authorship may be clarified. ··> Pileta[es]. East Asturian Magdalenian cave sites Tito Bustillo and El Buxu were used by the same group ··> Pileta[es]. Rock art found at Paleoindian site in Clarke Co., Virginia (USA) ··> Clarke Daily News. England’s Neolithic submerged town had market street ··> BBC. Rare Indus Valley Civilization seal found at Cholistan (Punjab) ··> Dawn. 20 megalithic cairn circles and an apparent fortification from the Iron Age found at Andrah Pradesh, India ··> Firstpost. Conservation plan to protect the Hill of Tara (Ireland) ··> The Meath Chronicle. Spanish language specialized open access e-magazine Trabajos de Prehistoria vol. 68, no. 2 is available. You may want to take a look at the latest exploration of Northern Europe’s autosomal genetics by Fennoscandia Biographic Project, using the most advanced analysis tools available (it seems): as always Scandinavians are somewhat distinct within Western Europe but Finnic peoples are a world on their own. Rice varieties indica and japonica may have been independently domesticated (paper): Independent Domestication of Asian Rice Followed by Gene Flow from japonica to indica (Chin-chia Yang et al. at MBE, PPV).